We've been happy to go to all of the amazing restaurants that we have featured in Portsmouth the last few weeks, but for this week we have an extra special seacoast favorite; Robert's Maine Grill. We made our way there on a rather grey-looking day, hoping to brighten up our scenery. We brought our questions, we brought our camera, and we brought our eager taste buds. Upon arriving to this much-talked-about Kittery restaurant, we met Jeremiah Fitzgerald, who was at one time Sous Chef and has now turned into Robert’s minister of marketing. We've been here a number of times so it's great to finally meet you. Please give us the inside scoop on all things Robert's, Jeremiah. Robert’s Maine Grill, the quintessential Maine restaurant, is a version of the big, classic Maine seafood restaurant that was rooted in the tradition of those places, but also inspired by up-to-date food trends like local farm-to-table ingredients and more creative recipes. 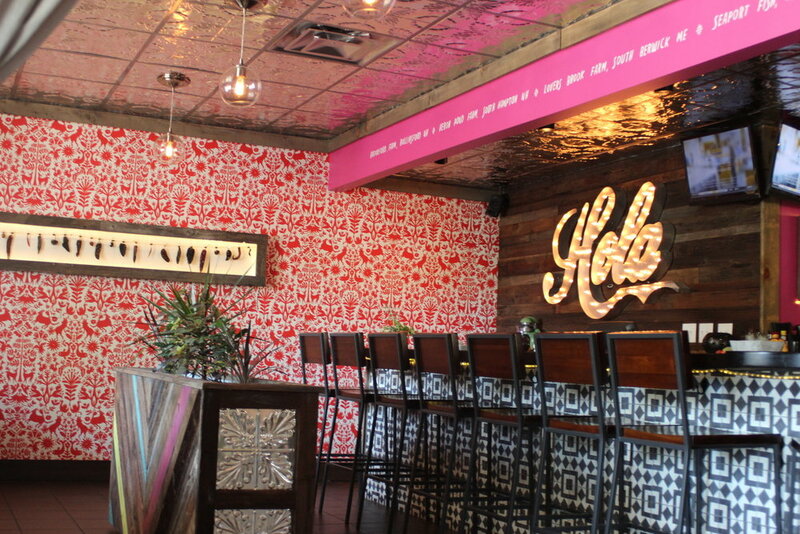 It’s a place where you can dress up for a special anniversary dinner or come in off the beach in flip flops for a lobster roll and French fries. Décor would also have to fit in this new cross-section of ideas. We built a big light house on the outside. We wanted to help “re-Maine-ify” Route 1. Inside we went open and airy but kept real, unadorned materials: wood, zinc, steel, and glass. High coffered ceilings and an open kitchen - in Maine the food does not come from behind a velvet curtain. You see the creek where the food comes from, you see the kitchen where it’s cooked just before being served and who is cooking it and it gets delivered to your table made of 200 year old repurposed wood - real, direct, simple. Simply stated it's an updated Maine classic. Robert's offers fresh Maine comfort food with an updated twist - highlighting simple robust flavors, a lively bar, raw bar and deck dining on the water. It's casual, approachable, affordable Appetizers are between $9-$19, entrees from $10-$25. Speaking of décor, we were welcomed with a colorful mix of paintings, prints, photographs, and even a few 3-dimensional pieces. The interior was beautiful and everything had a refreshing "Maine" feel to it without being to overwhelming. Also, out the window patrons get to feast their eyes on a view of the creek and woods beyond. After meeting some of the staff, Jeremiah gave us the grand tour. As if the main dining area wasn't pleasant enough, we had the chance to go upstairs to another level where they serve guests on busy nights. This is also where their 2nd-level open deck is located, for when the temperature doesn't require a coat, hat, and scarf to stay warm. We plopped ourselves in some wooden chairs around some wooden tables and took in our surroundings upstairs. Oh and did we mention the view? It looked even cooler looking down at the water being on the 2nd floor. We were lucky enough to sample two of their finest main dishes. The first was the pan roasted Cod with Littlenecks. What's in this mouth-watering meal? 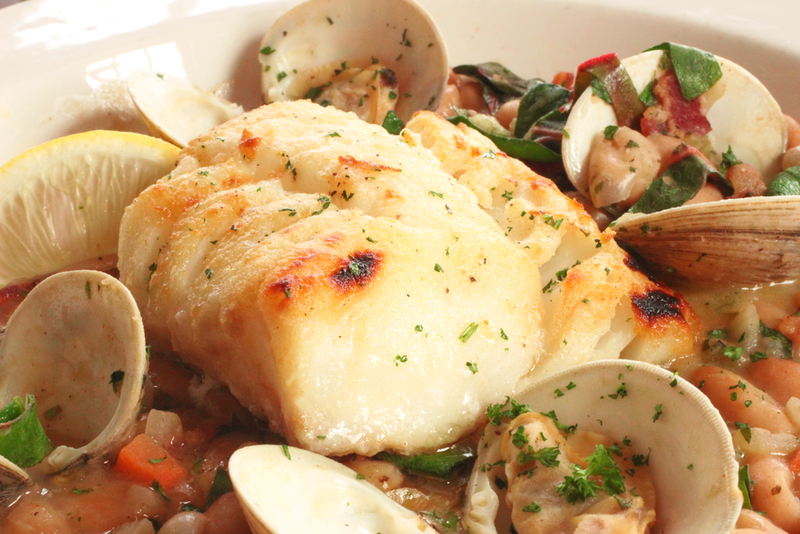 This dish has pan seared Atlantic codfish, paired with pan roasted littlenecks served with white bean and bacon ragout. Following the Cod was the Grilled Sea Scallops. Jeremiah, what makes us love this great New England meal so much? 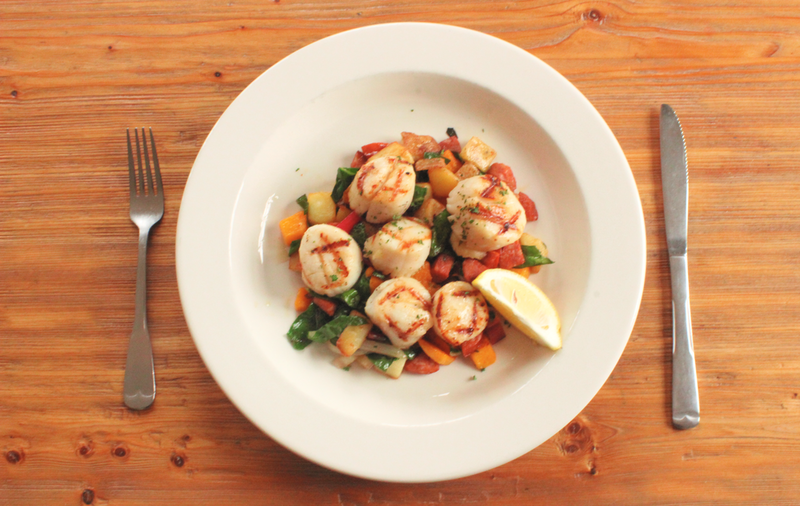 It has grilled sea scallops brushed with lemon butter, served with sautéed hash of swiss chard, potatoes, chorizo, and squash. After our meals we headed back downstairs to take a look at the raw bar. What can one expect to find at the raw bar? The raw bar features oysters from the North Atlantic. We try to have at least 5 varieties in house and we always have Maine oysters available. The mignonette is house made and changes daily. Lookout oyster fans! Robert's Maine Grill has plenty of different oysters for you to dive into at the raw bar. You've heard of shucking corn before, but have you heard of shucking oysters? To get that tasty oyster meat the oysters must first be shucked. This process is done carefully with a knife to remove the oyster meat from its shell. Jeremiah was kind enough to let us see this process in action. Thanks Jeremiah! We really enjoyed coming to Robert's Maine Grill. Please describe what it's like to be an independently owned business in the Portsmouth Area. At Robert’s, we’re proud to be locally owned and part of the seacoast community. A strong community connection is one of our bottom lines. We tried things that expressed our values - Community Suppers, a three course meal offered every Tuesday to show our love of our local community. We desire to be contributing citizens to our community - we donate proceeds from these nights to local non-profits. As of January 2013 we have expanded this success to include Wednesday nights. All You Can Eat Oyster nights celebrate our raw bar love and are crazy fun! We’re participating in the upcoming Portsmouth Restaurant week and the Kittery Block Party in June. We had a great time at Robert's Maine Grill and the next time we're in Kittery we'll be eating there again. 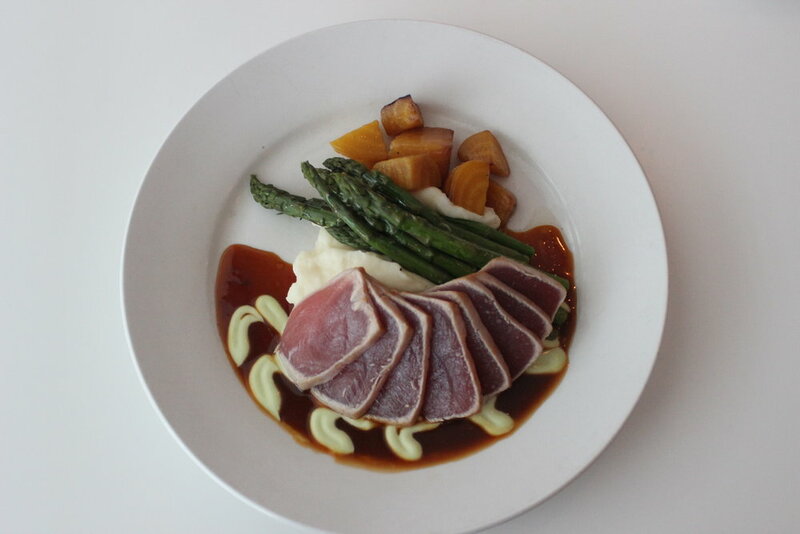 So whether you're hungry after a long day of shopping at the Kittery Outlets, passing through on your way to other parts of Maine, or even heading South into New Hampshire, Robert's is an excellent seafood restaurant that blends Maine traditions with a modern twist. They are open Monday through Thursday 11:30am to 9:00pm, Friday and Saturday 11:30am to 9:30pm, and on Sunday from 11:30am to 8:00pm. Stay updated with events and news by liking them on Facebook and following them on Twitter. Make sure to browse through all of the extra photos below, leave a comment, and share us on Facebook and Twitter. Thanks for reading!